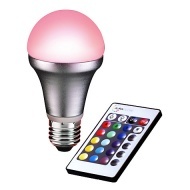 alaTest ha raccolto ed analizzato 10 recensioni su Auraglow 4W ES A55 LED Bulb and Remote Control, Multi. La media della valutazione per questo prodotto è 4.7/5, confrontata con la media della valutazione di 4.7/5 per altri prodotti. Abbiamo analizzato differenti valutazioni di esperti ed utenti, età del prodotto ed altri elementi. A confronto con altri prodotti, Auraglow 4W ES A55 LED Bulb and Remote Control, Multi ha ottenuto un alaScore™ complessivo di 84/100 = qualità Molto buono. Great effect for soft mood lighting, changes smoothly through colour range and easy to control, or leave on cycle for hours. Very pleasing effect and reasonable price. This is just Fantastic to change the colours is so easy, I am really so happy I purchased this item words fail me to say our good it is. Adore this LED bulb - genius! My daughters bed is not near her lamp so this fantastic remote control bulb is really great and the colour changes are just an added bonus. There is a good range of colours and functions to create your desired ambiance with the added bonus of being a low energy bulb. brilliant fun, easy to use and my 5 yr old now has a disco in his bedroom! lovely light would be nice in the dining room when entertaining too.